TWO YEARS AGO, I walked around Sweden’s Gamla Uppsala, where old Swedish kings are buried beneath mounds of earth and where the holiest site in Scandinavian paganism was razed to build a Christian church. I was struck by the degree to which Scandinavia still feels its slow, sometimes painful conversion today. Some Scandinavians, like those in Moster, Norway, participating in this year’s reenactment of the lives of Olaf Trygvesson and Olaf Haraldsson, celebrate. Others, like the neopagans who torched 22 historic Scandinavian churches (including several 900-year-old stave churches) between 1992 and 1997, lament. Scandinavia’s everpresent link between cross and crown, a legacy of its conversion process, is again a hot topic as the Church of Sweden readies to disestablish itself as the state church in January. The conversion of the original Vikings is a painful, complicated story. The conversion of each Scandinavian region was due to a variety of factors: missions, politics, miracles, and the like. We've opted, somewhat arbitrarily, to focus on one key factor for each region. For example, we've emphasized the role of missionaries in telling how Denmark converted, though Christianity’s spread in that country also strongly depended on political support. And we've concentrated Norway’s story on its conversion by the sword, though scholars emphasize other factors, such as economics and missions. Many of these top scholars (and writers) have helped us put together this issue. Birgit and Peter Sawyer ("Why Trust the White Christ?") 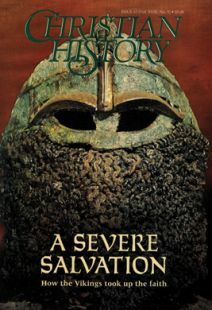 are the world’s leading experts on the Viking world, especially when it comes to its encounter with Christianity. Richard Fletcher’s The Barbarian Conversion ("Converting by the Sword") is being hailed as a landmark book on the subject ("No book on such an important and demanding subject combines entertainment, information, and stimulation more judiciously,” wrote the New York Times). James Marchand ("Althings Work to the Good") is a well-respected translator of primary source material, like the Islendingabók he wrote about for us. Michael Scott Rohan and Allan Scott ("Dead Man Converting"), award-winning science-fiction writers, have written the only book for a popular audience completely about Scandinavia’s conversion. And journalist James Reston, Jr. ("Be Christian or Die"), has proven himself a master at retelling the old sagas. Even with such a premier list of guides, Scandinavia’s conversion is a challenge to digest at points, filled as it is with strange names and troubling moments. But the story is nonetheless fascinating and revealing, like the living monument of Gamla Uppsala, of the ongoing conversion of the world to Christ. How and why the Viking’s old world ended. When it comes to conversion by the sword, few can match the ruthless exploits of King Olaf Trygvesson. Besides spiritual solace, Vikings were attracted by Christianity’s tangible blessings.